Well, I’m 99.5% sure that’s what this is. The only remaining thing would have been to pick it, slice it, and see if it stained to a bluish color (if so, not edible). But I didn’t have any of my books or notes with me, and hadn’t reviewed them beforehand, not expecting to find any boletes on that hike. A pity, because this one was in beautiful shape for collecting — big enough to be a good find, yet young enough to probably be free from fungus gnat maggots. However, it’s always better to miss out on a treat than it is to mistakenly eat something poisonous, and I know where I found it, so I have a spot to return to. 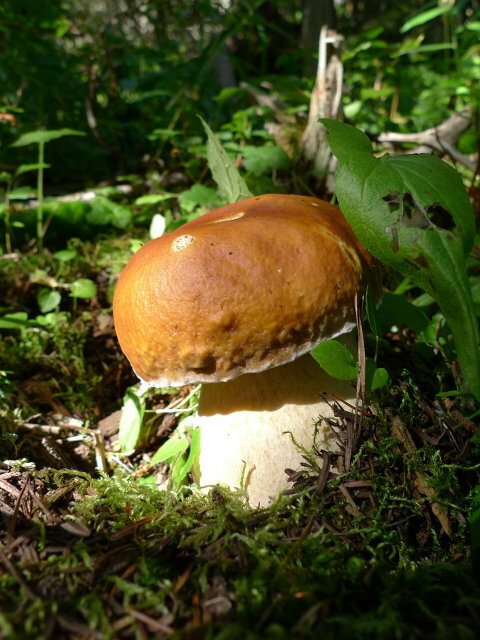 It looks like a boletus edulis – right shape, cap and stipe color plus reticulation on the stipe. The altitude is right for this time of the year. If the tube color were whitish to light yellow and the flesh didn’t stain blue or taste bitter then I’d say without a doubt that it is a boletus edulis. I would have grabbed it if the cap and stipe were firm (a useful test for maggots especially in older specimens). Often when I pick an otherwise choice edible that turns out to be buggy; I “spike” it on a branch stub on a tree under the likely mistaken theory that this helps spread the spores.